One of the meals I made from last week I LOVED. It was so super easy and delicious. I will share the recipe soon! It was the chicken, potato & green bean dish it called for oven cooking, but I did it in the crockpot. I am trying to gather crockpot recipes for summer. I will primarily cook on the grill or in the crockpot over the summer and do most baking in the early morning to keep things cool in the house as much as possible. What is your favorite grill or crockpot recipe? In perusing the internet I found a recipe for Kueh Keria- Malay (sweet potato doughnuts). I had some sweet potatoes to use up and decided to convert this to GF. It is a Gluten Free, Dairy Free and Egg Free. This is another recipe I will share soon. If you enjoy the blog don’t forget to subscribe by email (upper right) and then you won’t miss a post! found these. They were about $3 for the pack which I thought was great price. 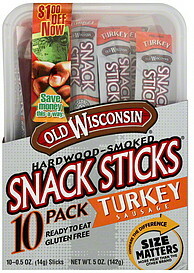 It’s not something that I would eat regularly, but I think a great grab and go, keep in your purse for “emergency” food. I don’t know if you know that original Slim Jims are not gluten free. I loved Slim Jims when I was growing up. These are a great alternative, with great flavor. Welcome to Monday! Were you inspired by recently posted recipes….Gluten Free Ricotta Pasta with Zucchini & Garlic or Lemon Blueberry Bread. If not maybe you’ll be inspired to get in the kitchen and make Raspberry Truffles, recipe will be coming on Wednesday. You can subscribe to the right to not miss a post and have it emailed directly to your inbox! On a more serious note, my mom just shared a link with me that really got me thinking. This blog is dedicated to GF, however, with gluten issues often come other allergies as well. So I am sharing this link, to further your education on other allergies, one you may have or someone you know may have. If you have my cookbook or follow the blog you know I talk about this scoop often. I use this scoop for muffins, cookies, fritters, doughnut holes, meatballs, Mounds. It is one of my favorite tools in the kitchen. It makes the tedious work so much easier and faster. I purchased my scoop from Pampered Chef and I’ve been very happy with it. But, I’m sure you can get something comparable at Walmart, Target or Bed, Bath and Beyond. The one I use the most is the 1 Tablespoon scoop. I adapted this from Rachael Rays 365 No Repeats Cookbook. These are all 30 minute or less recipes. Which I have found sometimes take a bit longer the first time, but all in all are quick and easy. It was a hit with the whole family and also reheated nicely. I fed 2 adults and 4 kids with this and had a bit left over. I think she said it serves 4 in the cookbook. I would say 4-6 people. Place the ricotta, butter and Parmesan in a large bowl. Heat a small skillet over medium heat. Add the oil and onions and cook for 7-8 minutes then add zucchini and cook until desired tenderness adding garlic in last minute. Turn off the heat. pepper. If the pasta is too thick add 1/4 cup hot water at a time until desired consistency. I had to do this. Add the veggies to pasta, toss and serve topped with extra cheese. I have worked out my menu for May. I have lots of new recipes to try out in the next 4-5 weeks. One of them this week on Thursday and the one on Sunday. I had the New England Cheese Soup on the menu once before, but it got bumped so I haven’t actually made it yet, my family loves cheese so I’m sure it will be a big hit. I will be trying to make the Raspberry Truffles this week if everything works out and will be sharing the recipe if it’s a success. I hope you had a fabulous weekend and that this coming week is a good one. This is a new recipe from Rachael Ray cookbook. This is the result of another one of my pinterest finds. My friend, Allison, posted it and I knew immediately I must convert this to GF. I’m not usually a big fan of lemon, but when combined with blueberry it piqued my interest. This is one of those items that is multifunctional – breakfast, snack, dessert. Prepare loaf pan. Lightly spray with cooking spray and sprinkle sugar on the bottom and sides, if you want. I use a coarse Turbindado sugar for this. In a large mixing bowl mix kefir, sugar, eggs, zest, vanilla and oil together. In a separate bowl whisk dry ingredients: flour, baking powder, salt, xanthan IF not in flour. Add dry ingredients to wet and beat until the color lightens slightly, about 2-3 minutes. In a separate bowl combine berries and 1 T. flour, stir to coat berries with flour. This should help them not all sink to bottom. I should because, in my experience, it doesn’t always work. Once coated gently fold blueberries into batter. Pour into prepared loaf pan. The batter is a little thin. Bake at 350° for 50-60 minutes. Check after 50 minutes. A toothpick should come out clean or maybe a few tiny crumbs. If not done bake at 3-5 minute intervals until done. Syrup: While the bread bakes make your syrup. Combine lemon juice and sugar in a small saucepan. Cook over med-high heat until sugar is dissolved completely. Let boil 1 minute. Once the bread is out of the oven use a toothpick or long pick to poke holes in the loaf along top and sides. Then brush the lemon syrup on the HOT loaf of bread. Brush one the top and sides of loaf and let sit for a couple of minutes to soak in and then repeat until syrup is gone. Let loaf cool completely. Once loaf is cooled make the glaze. Combine powdered sugar and 2 Tablespoons of lemon juice. Stir until smooth and no lumps. You want a thick but pourable glaze. If it’s too thick add a little more lemon juice. Pour glaze over loaf letting it run down sides. My husband came through surgery successfully. Recovery has been a rough, but a bit better than last time, so we are thankful for that. Thank you all for the prayers and support, it is so appreciated. He will begin physical therapy soon. This week we will try to “catch up” on the things that fell through the cracks last week because of the surgery. I have a great recipe to share on Wednesday….Lemon Blueberry Bread. I have a couple of new things on the list to try, not sure if I’ll get to them this week or not. Which would you like to try more? Apple Wrapped Ricotta Tarts or Raspberry Truffles? So I found this recipe when I was searching for what to do with the leftover ricotta I had bought when I made lasagna. I had intended to make a double batch of lasagna, however, my homemade GF pasta didn’t turn out that well, my pasta maker didn’t work and I realized then that I did not have a full size rolling pin…..all that to say, I found three recipes to use up the rest. This is one of them. I had to convert it to GF, but it was a total success and relatively quick and easy. The longest part was letting the oil heat up, you will need a thermometer for this. When my kids were eating these they kept calling them doughnuts. I said they are fritters. They wanted to know what the difference is…..I wasn’t sure. So, I did a bit of research. Doughnuts and fritters are both fried dough, and typically the difference is fritters have meat, fruit or seafood add to the batter before frying. These do not have any of those, so I’m not sure why they are called fritters, but they are. Either way you will thank me when you make them and feel free to make them “authentic” by adding meat, fruit or seafood of choice. You’ll probably want to omit the powdered sugar dusting if making a meat fritter. Bowl of batter, spider for removing fritters from oil, scoop and powdered sugar shaker. Oil for frying – I used peanut oil in a cast iron dutch oven, you need it to be about 3-4 inches deep. In a large bowl whisk together ricotta, eggs, sugar and vanilla until smooth. Once smooth add the flour, salt and baking powder continue whisking until it is all incorporated and smooth. Once your oil reaches the right temperature work in batches to fry the fritters. I used the small Pampered chef scoop, it’s about 1 Tablespoon. I was able to fry about 18 at a time. They will turn themselves as they fry, but you might want to move them around a bit for even browning. Fry them until they are a deep golden brown, maybe 3-4 minutes. Use slotted spoon to remove from oil and place on rack or paper towel lined plate. Let them cool slightly and dust with powdered sugar. They are amazing warm and still great once they are cooled completely. I think that you could totally fill these with custard, jam or cream filling. I will have to try that. If you try making these with or without the additions come back and leave a comment letting me know how it turned out.